The Best [Darn] Beer & Food Cookbook [Ever]? A gorgeous early autumn day made for the enjoyable part of today's long drive back from Georgia to northern Virginia. 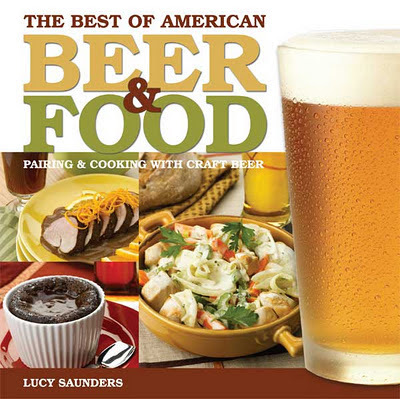 ... and the new cookbook from Lucy Saunders, waiting for me in the mail: The Best of American Beer & Food, from Brewers Publications. Its first section reminds me of Real Beer And Good Eats by Bruce Aidells and Denis Kelly. Lucy has arranged into "Food and Beer Across North America" (really, mostly the US), interviewing chefs and restaurant/pub owners. The second section features the recipes, reminding me of Cooking & Eating with Beer by Peter LaFrance. Lucy gives props to DC/Baltimore area locals: Brewers Art, Brasserie Beck, Restaurant Nora, Birreria Paradiso, Rustico, R.F.D./Brickskeller, Tuscarora Mill, and Royal Mile Pub. She includes recipes from those last three as well. Two are from Diane Alexander of R.F.D./Brickskeller, including Chicken and Artichoke Hearts in Anchor Steam Beer. Tuskies has its Asiago Soup with Smoked Ham. Royal Mile Pub's Ian Morrison provided his recipe for Lemon Thai Basil Sorbet; at a Clipper City beer dinner, he had paired that with Loose Cannon Hop3 Ale . Saunders also offers a recipe from Chef Barton Seaver, past of Cafe Saint-Ex, now owner/chef at sustainable seafood restaurant Hook. It's his Grilled Lamb Top Round Steaks with Caramelized Tomato Risotto, which he prepared for a Clipper City Beer Dinner at Cafe Saint-Ex. Lucy puts in an extended essay on beer and cheese early in the book. I'll be reading that carefully (and the one on beer and chocolate). Please don't dismiss Pilseners as being unworthy of being served at the table with lighter or simpler fare, as many craft-brewers are restoring the brightness and luster to a style that suffered commercial debasement in the last century. A bready yet crisp Pilsener tastes outstanding with a freshly grilled burger - it's simple and very good. That said, some of the recipes included in this book are far from simple and could only be termed ambitious. These time-consuming recipes show that craft beer can pair with complex foods just as well as with burgers, sausages, and pizza. Lucy Saunders indeed knows food ... and beer. The barrel has been tapped! Iron City buffs the rust? a toothy smile for Prez! Beer etchings: ultimate beer glass? National Parkinson Foundation: any interest? Nevermore for Baltimore Brewpub, Capitol City.